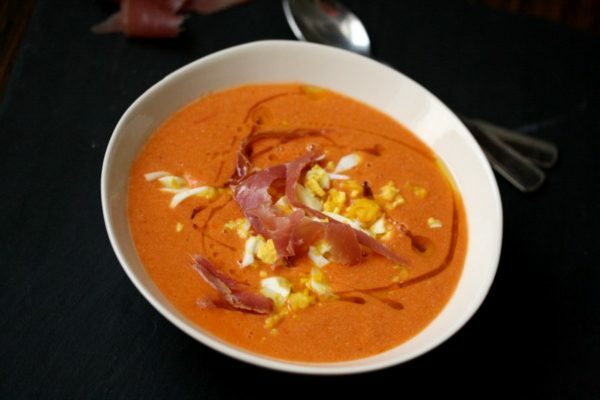 The first time I tasted Salmorejo Cordobes was not in Cordoba. It was in a small town in Southwestern Spain, about half an hour up the coast from Cadiz, one of the oldest port cities in Andalusia. I was traveling by myself after college graduation and had just come off of a rather unfortunate three days in Malaga, where I spent most of my time curled up in the fetal position on my hostel bunk bed, making non-so-discrete trips to and from the communal bathroom every 20 minutes. The one afternoon I was well enough to venture out, 5 blocks from the hostel I was jumped by a group of 13-year-olds with leopard spotted buzz cuts. They didn’t take my wallet, since it became apparent their goal was to reap their profit through humiliation. So they just punched me repeatedly in the arm while pouring my gringa industrial-sized water bottle over my head in broad daylight in the middle of a crowded street. Needless to say, I was excited to head to Cadiz, even if my dignity, along with a few empty boxes of Imodium, stayed behind in Malaga. After a few more successful nights in Cadiz, I decided to take a day trip to check out one of the nearby beaches. As per usual, I found myself on a public bus unsure of whether or not I was actually going where I thought I was going. I somehow always end up traveling alone in Spanish speaking countries even though I can barely say my name in Spanish. And this being one of the first trips of this sort, I was even more clueless than usual. But my technique was to scope out the crowd for a youngish looking person with a sweet face who might speak decent English and want to take pity on me. And on this particular bus, that person was Rose. It turned out that Rose was looking for the same beach and was equally clueless. Fortunately for both of us, Rose was from Madrid and could ask the bus driver using sentences that weren’t 50 percent Italian, 20 percent Spanish, 20 percent English, and 5 percent gibberish. Her English wasn’t great, but she managed to ask me if I’d like to go to the beach with her and have lunch. We spent the afternoon chatting on our towels, passing my Spanish to English phrase book back and forth and writing out words in the sand. I’m sure our 4 hours of verbal toiling probably amounted to less than my Jewish high school friends say to each other in a 5 minute phone call. But I still managed to learn some key facts: Rose was a journalist living in Madrid, she was engaged and her wedding was in the fall. And apparently I was now invited. Over lunch, Rose also introduced me to the best cold soup I’d ever tasted. 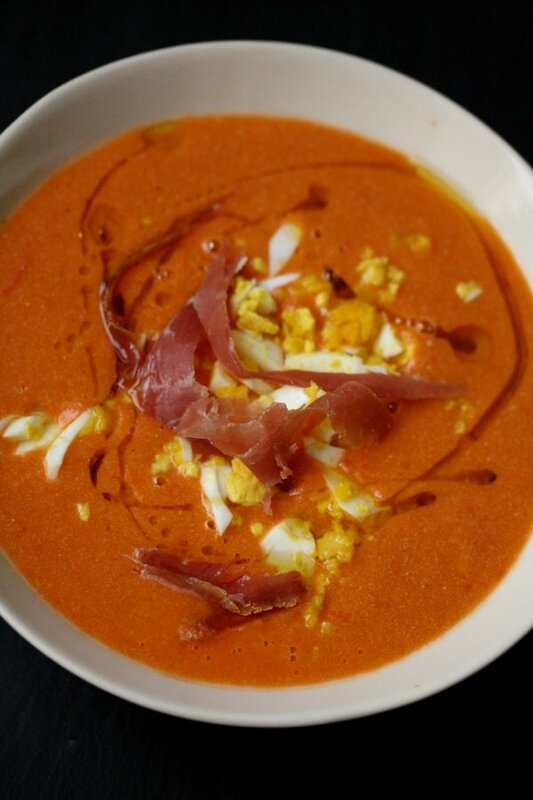 Salmorejo is basically the Andalusian version of gazpacho, the cold tomato soup ubiquitous in the North. But theirs is basically the “bisque” version, smooth and creamy without chunks of vegetrables. 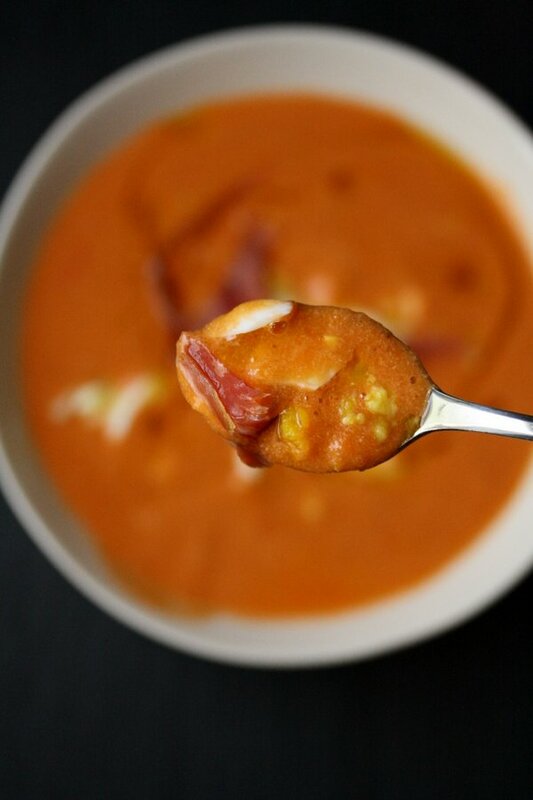 Instead of the heavy cream we find in our similarly complexioned warm tomato bisque, this cold soup gets its orange, silky body from lots of olive oil and some stale bread. 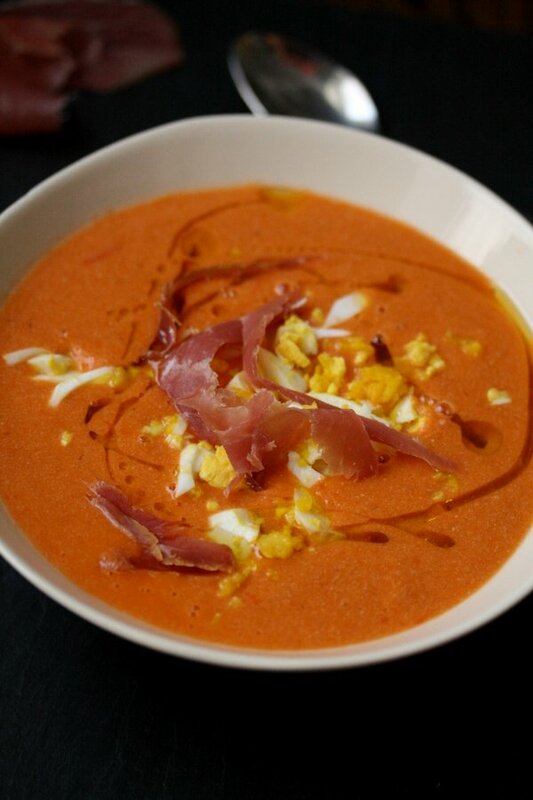 The soup is served tapas style, like the majority of dishes in the South, in small Terracotta ramekins garnished with crumbled hard boiled egg, strips of Jamon Iberico or Serrano, and even more olive oil.I tried for years to recreate the Salmorejo I had that first day in El Peurto de Santa Maria with Rose. But it always ended up tasting a little grainy and garlicky and raw. But recently I was craving it—or perhaps I was just craving travel in general—and I decided to try a version with gluten-free bread. 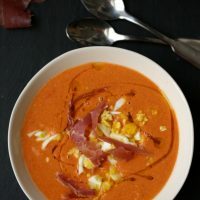 I came upon this recipe from the chef of a local Spanish restaurant right near my apartment in New York. Her trick was to soak the vegetables and bread in hot water to soften everything. I knew that gluten-free sandwich bread would not hold up to this in the same way a stale baguette would, but I decided to try it anyway with the vegetables, adding the bread in at the very end to soften it just a little. The result was creamier and more subtle than in my past attempts—much closer to the soup I remembered from that day. I ended up meeting Rose for coffee once I made my way back up to Madrid. She brought me a Guerlain lip gloss as a gift and reiterated that I must come back to Spain for her wedding in the fall. I realized then what our conversations via literal sand-skrit had kept me from seeing: in addition to being extremely sweet, with excellent taste in tapas, Rose might have also been a little crazy. Regardless, I am forever grateful to her for showing me the way to the beach and for helping me navigate the best of Spanish cuisine. And luckily, I am just crazy enough to share the best dish of all with you. 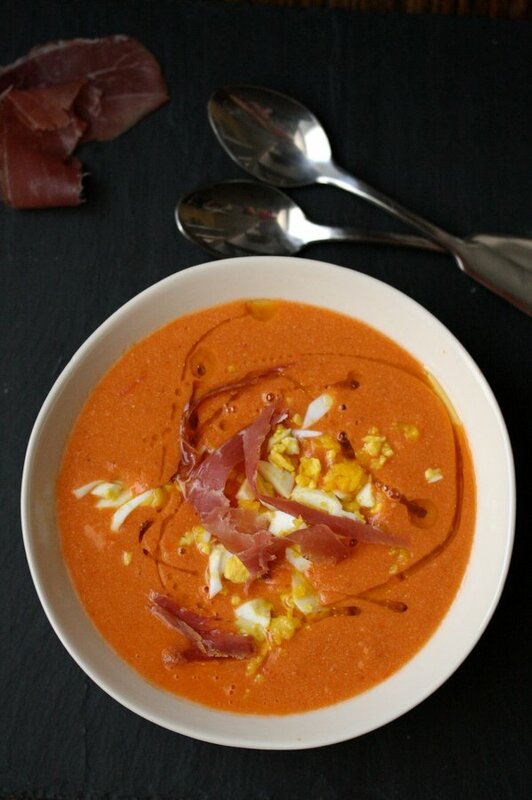 Salmorejo Cordobes is a creamier version of gazpacho, the Spanish cold tomato soup. 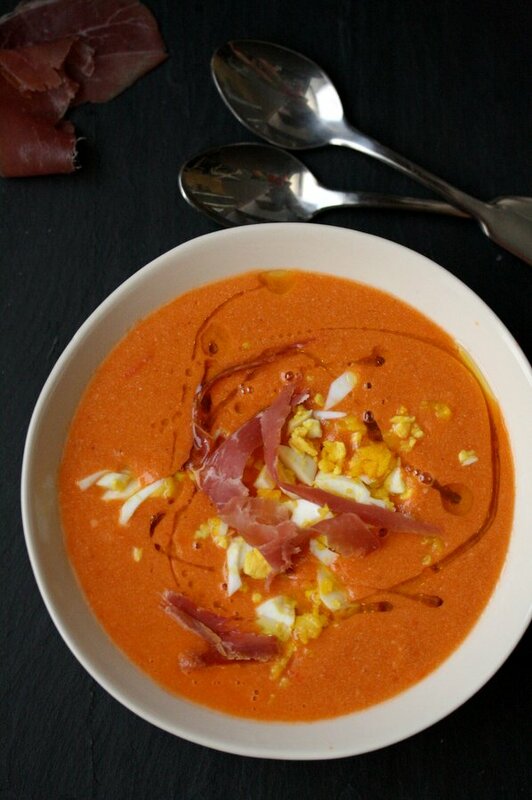 My easy recipe uses gluten-free bread, olive oil, prosciutto, and egg. Cut the tomatoes in half lengthwise and remove the core by cutting a triangle around the top. 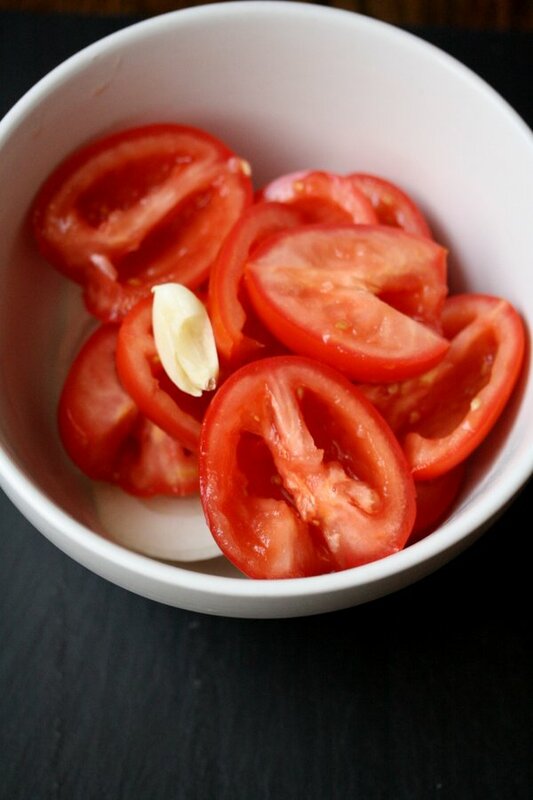 Seed the tomatoes over a bowl, using your fingers to remove the inner flesh. 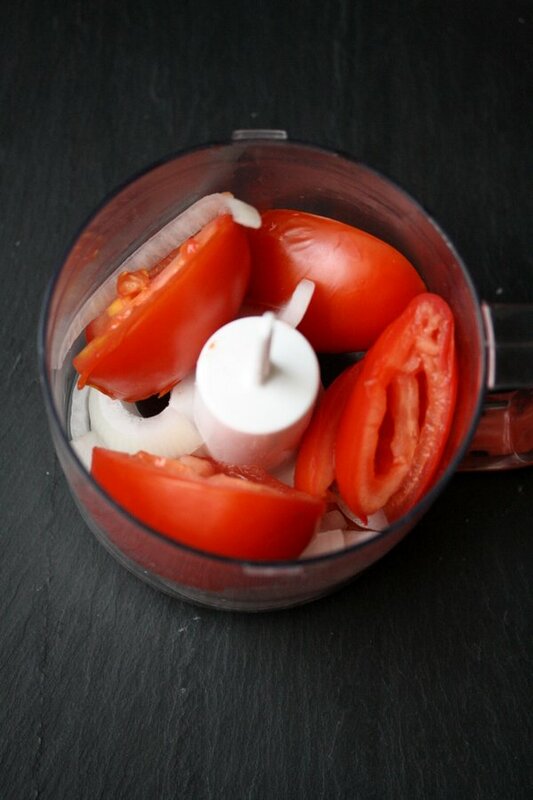 Place the tomatoes, garlic, and shallot in a medium mixing bowl and cover with 2 cups of boiling hot water. Cover the bowl with a plate and allow to sit 30 minutes. Add the bread and toss until soggy. Remove the vegetables and bread with a slotted spoon and transfer to a food processor or blender. Reserve the soaking liquid. Puree the mixture along with the sherry vinegar and 1 teaspoon salt until smooth. Stream in the olive oil and blend until orange and frothy. Add some of the cooking liquid to thin, if necessary. Taste for seasoning and add more salt as necessary. 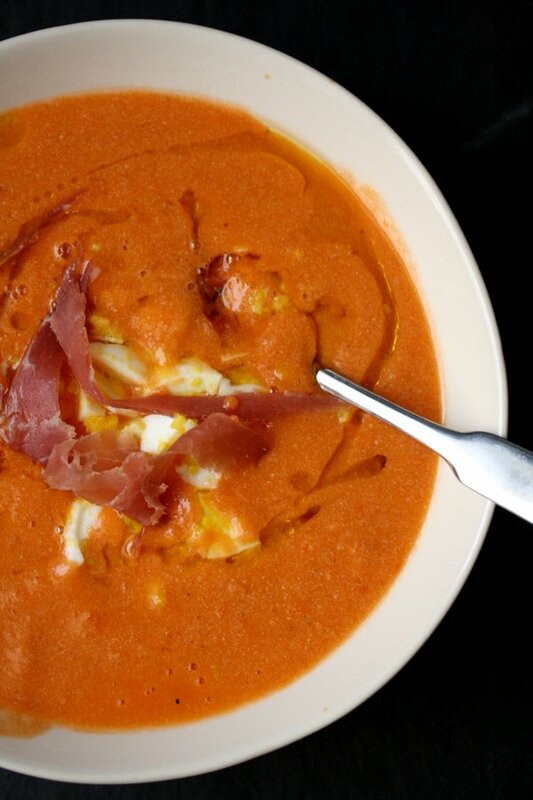 Transfer to serving bowls or cups and garnish with the egg, ham, and a drizzle of olive oil. The recipe yields 2 larger appetizer portions or 4 tapas-sized portions. I don’t like gazpacho so this looks like the cold soup for me! Do you toast the bread to make it “stale”? exactly! toasting it dries it out so it soaks up all the liquid and becomes soft. I’m in Madrid at this time and love this soup, enjoying it many times at Mercado de la San Miguel. I’m so happy you shared your recipe, I will make many times upon my return to California.